any idea @anna, @rowasc ? 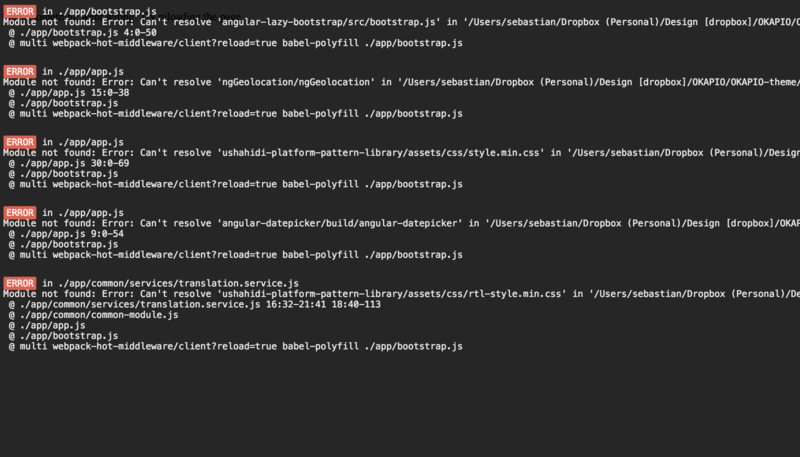 I think webpack can't find my version of the pattern library? [Anna Iosif, Ushahidi] what does it say after “ushahidi-pattern-library” in your package.json file in the client? do you think I need to modify webpack.config.js in some way? Could you tell me about how to use ushahid V3 api to get data? have try following the document but it is not working for me? [Anna Iosif, Ushahidi] if you look in your terminal window, do you see any errors there? [Anna Iosif, Ushahidi] after running gulp? [Anna Iosif, Ushahidi] do you see the missing files there? [Anna Iosif, Ushahidi] and run npm install again just to be sure, do you see any errors when you do that? [Anna Iosif, Ushahidi] any errors now? [Anna Iosif, Ushahidi] ok, do you know if you have browserify installed? the pattern library I'm using on github doesn't have the css directory either, could that be the problem? shall I npm install again in the pattern-library directory? is there a way I can send you the screenshot via PM? I don't see an option to send via PM? [Anna Iosif, Ushahidi] Have you worked with the pattern-library yourself? Did you run it locally on your computer? [Anna Iosif, Ushahidi] ok, it sounds like something in your setup is wrong, have you changed other things too? In webpack for example? [Anna Iosif, Ushahidi] have you stopped gulp from running and started it again? [Anna Iosif, Ushahidi] Hi Sebastian, how is it going? Any luck? [Anna Iosif, Ushahidi] Ok, I just spoke to a colleague who recommended to start with removing node from your machine and reinstall it. Could you try that and then see if it works? should I just go ahead and reinstall node? [Lim Socheat] but always redirect me to the 404 not found page.